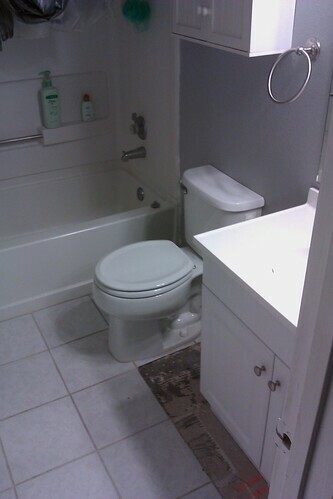 This is the bathroom with everything in it when we started. 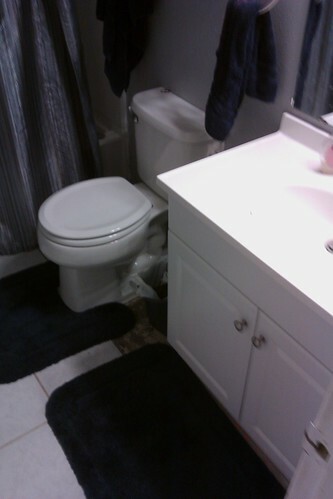 This is the bathroom minus the towels and everything moved out. Tighten the knobs and unscrew the hoses with an adjustable wrench. 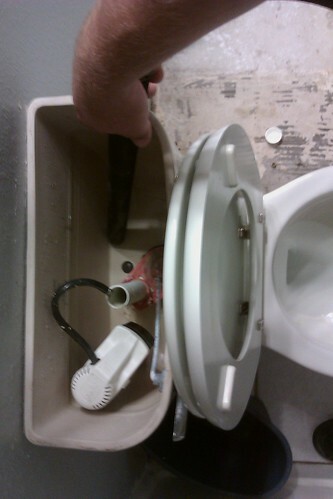 Loosen the J bend from the vertical pipe going to the sink. 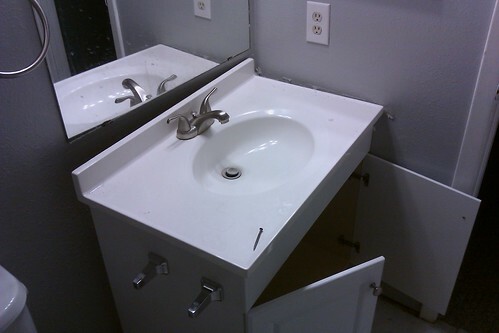 Loosen and remove the screws holding the vanity to the wall. 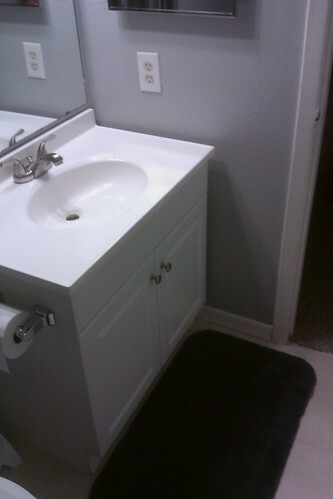 Use a putty knife to scrape between the vanity and wall, loosening the silicon there. Vanity takes a ride on my skateboard. Remove the bolt covers and loosen the nuts with an adjustable wrench and break the silicon seal with a putty knife. 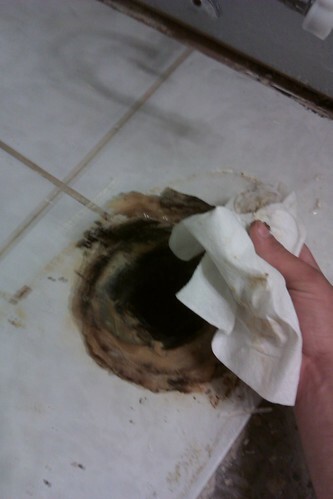 Cut off the water to the toilet, flush it, and remove remaining water with a sponge or a wet/dry vac. 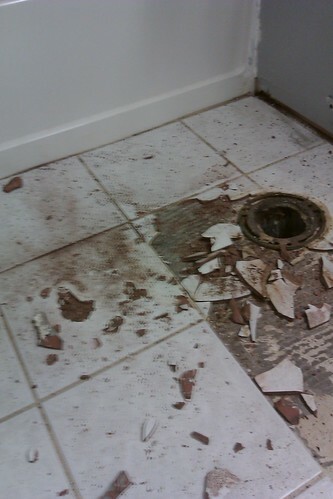 Toilet is gone! Note the wax ring all smashed into the drainpipe. 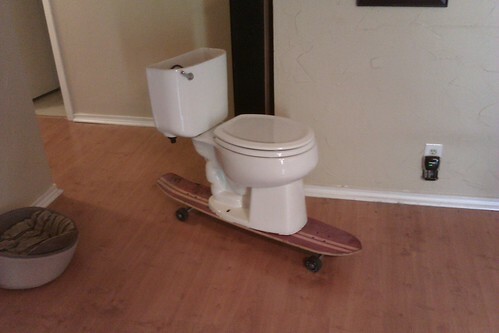 The toilet takes a ride on my skateboard. Remove the wax. I used a papertowel and a heat gun, heating the wax till it melts then using the papertowel to gather up the melted wax. Wear your safety gear for this next part: gloves, glasses, hair cover, boots and dirty clothes. 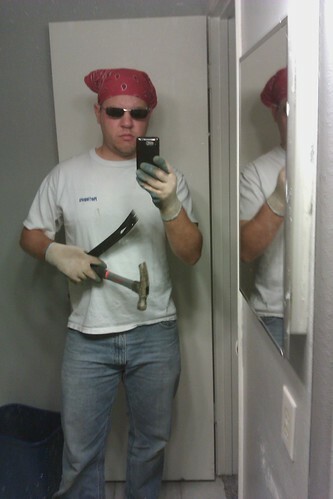 Yeah, I know I look awesome. Now it’s broken! Note the rag I put in covering the drainpipe to protect us from odors and the pipe from broken tile. 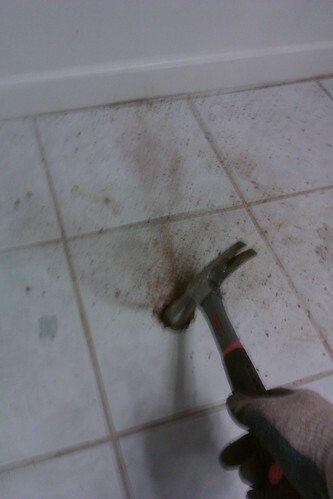 Scrape all the residue off the floor. Notice I also sanded and then texturized some spots on the walls that I wanted touched up. Find the center of the floor and mark a tile there. 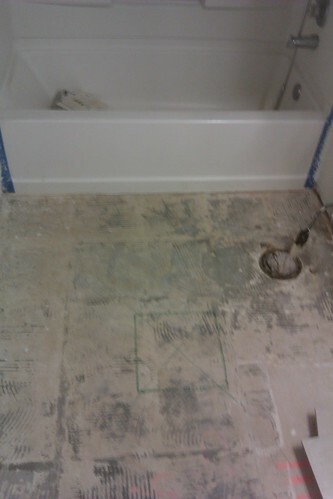 This will be the first tile that you lay down and all the other tiles will be placed according to this center tile, so make sure to measure and then measure again. Lay the center tile and then lay tiles towards one wall and keep placing them in such a way that you don’t tile yourself into a corner. I borrowed my stepdads wetsaw for this part, which is about the only way to cut so nicely around the drainpipe and all the small side pieces too. 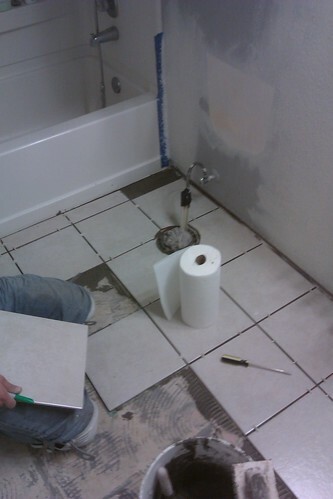 Use plastic tile markers to keep all your tiles nice and square. 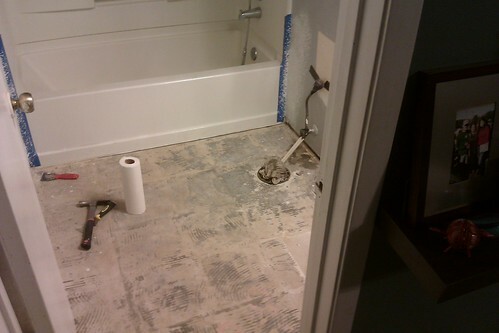 Tile all done and primer is now on the wall. 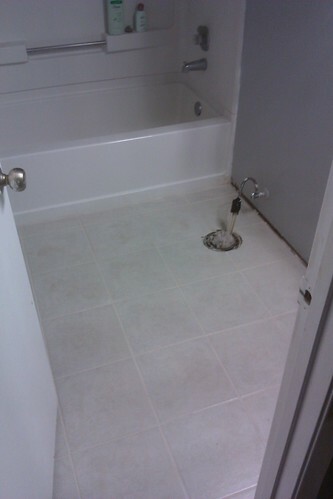 Paint and tile markers removed. 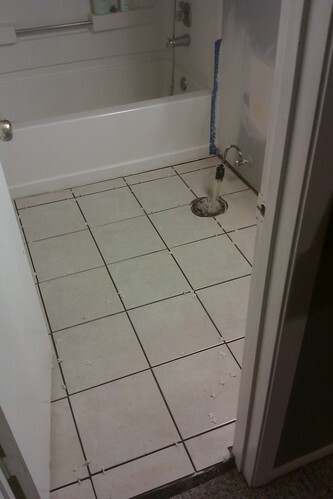 Grout the tile. 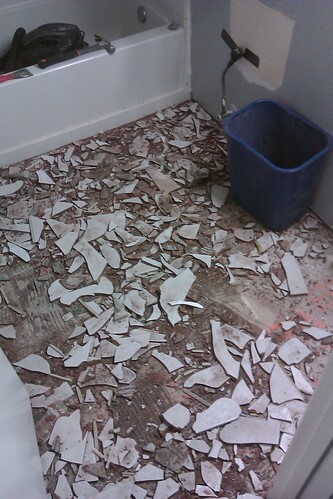 Make sure to clean all the tiles off really well or you will have a rough and tough job getting it off later. 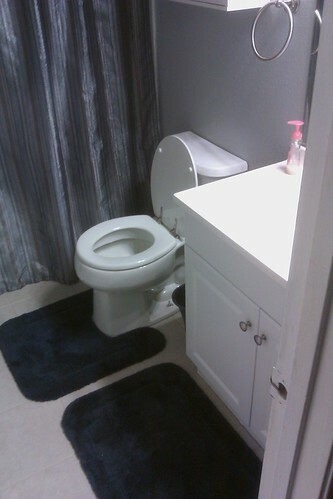 Toilet is back. I usually get a new wax ring and bolts. 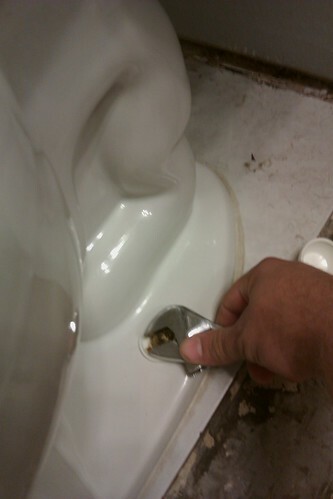 I also made sure to upgrade the water control valve in the toilet so that it flushes quickly with one little push of the handle. 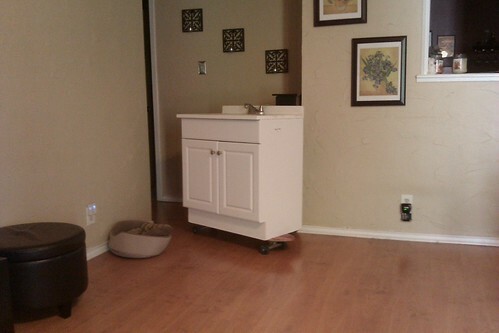 Vanity is back in. 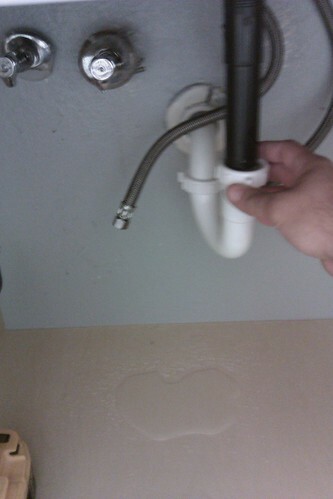 I did have to replace the J bend and the vertical sink drain pipe because I broke it while trying to fit it all back together. 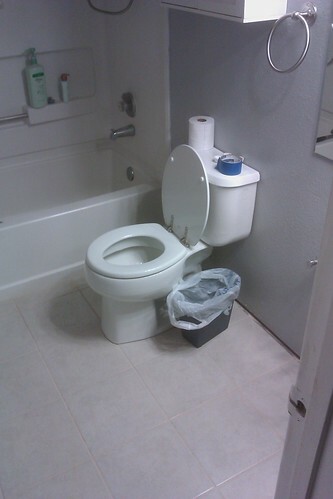 You really can’t tell that all that much work has been done, but it took our bathroom from a work in progress to a place where you can drop a deuce in peace. 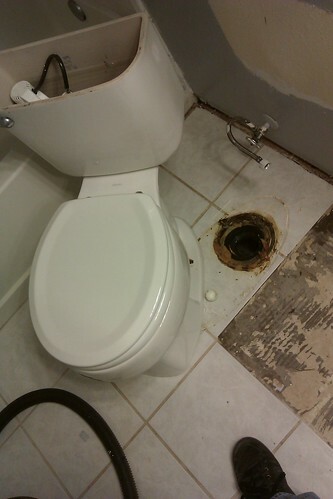 This was a really miserable job for a small gain, but it was a project that Needed to get done once it got started. 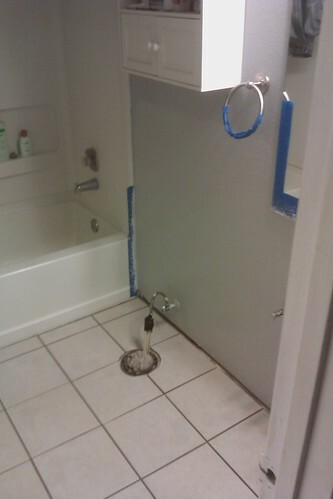 Like most home projects I almost wish I had just moved into a hotel for a few days and hired a professional, but then I reflect on the money that we saved and how much I learned in the process, and I feel like I can dust my hands off and enjoy a cold beer after a job well done. 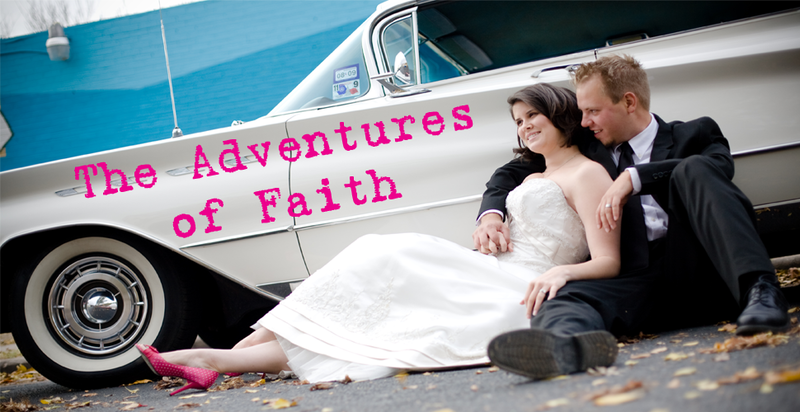 I love this post so much! Great job John! You're making me wish that I had Tony do all our improvement related posts. John you did an awesome job and I agree the last paragraph made the post! Great job!